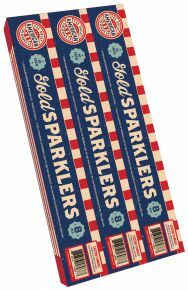 These 20" long, high quality, wire sparklers burn almost smokeless, bright gold, and have easy light tips. They are perfect for using at weddings and receptions! 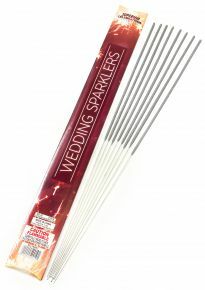 These 10" gold sparklers are great for any festive occasion! These sparklers are made with wire cores instead of bamboo wood, so that they burn much cleaner and with far less smoke. 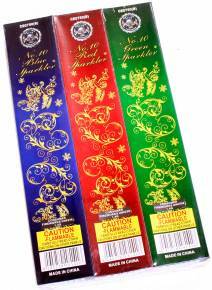 These 10" color sparklers come in red, green, and gold - 4 boxes of each color. The effect is more torch-like than a traditional gold sparkler because of the added color, but is still a fun addition for parties and celebrations! 36" gold, wire sparklers are the longest sparklers available! These long sparklers burn for well over 3 minutes with a near-smokeless gold sparkle. Each pack has 1 piece of each of the above colors. Each sparkler is 17" long. The gold one is a traditional sparkler; the green, red, and blue are colored torches (fluorescent flame with less "sparkle" effect). These 22" red, white & blue glow necklaces are perfect for your next 4th of July party or fireworks festivity! Beautiful floating luminaries or wish lanterns that create a glowing ambience on any pool, fountain, or lake. The lanterns are made with a bamboo base and flame-retardant white paper, and include tea-light candles for illumination. Each pack contains two lanterns.